(a) The owner of this site ("Australian-Shepherd-Lovers.com") maintains this web site (the “Site”) as a courtesy to those who may choose to access the Site (“Users”). The information presented herein is for informative purposes only. Australian-Shepherd-Lovers.com grants permission to Users to visit the Site and to download and copy the information, documents and materials (collectively, “Materials”) from the Site for the User’s personal, non-commercial use, without any right to resell or redistribute them or to compile or create derivative works there from, subject to the terms and conditions outlined below, and also subject to more specific restrictions that may apply to specific Material within this Site. (b) The reproduction, duplication, distribution (including by way of email, facsimile or other electronic means), publication, modification, copying or transmission of material from this Site is strictly prohibited unless you have obtained the prior written consent of Australian-Shepherd-Lovers.com or unless it is expressly permitted by this Site. The material covered by this prohibition includes, without limitation, any text, graphics, logos, photographs, audio or video material or stills from audiovisual material available on this Site. The use of materials from this Site on any other Web site or networked computer environment is similarly prohibited. Requests for permission to reproduce or distribute materials found on this Site can be made by contacting Australian-Shepherd-Lovers.com in writing. (c) Australian-Shepherd-Lovers.com administers this Site. All Material on this Site from Australian-Shepherd-Lovers.com appears subject to the present Terms and Conditions. YOU EXPRESSLY UNDERSTAND AND AGREE THAT Australian-Shepherd-Lovers.com SHALL NOT BE LIABLE FOR ANY DIRECT, INDIRECT, INCIDENTAL, SPECIAL, CONSEQUENTIAL OR EXEMPLARY DAMAGES, INCLUDING BUT NOT LIMITED TO, DAMAGES FOR LOSS OF PROFITS, GOODWILL, USE, DATA OR OTHER INTANGIBLE LOSSES (EVEN IF Australian-Shepherd-Lovers.com HAS BEEN ADVISED OF THE POSSIBILITY OF SUCH DAMAGES), RESULTING FROM: (i) THE USE OR THE INABILITY TO USE THE Australian-Shepherd-Lovers.com SITE; (ii) THE COST OF PROCUREMENT OF SUBSTITUTE GOODS AND SERVICES RESULTING FROM ANY GOODS, DATA, INFORMATION OR SERVICES PURCHASED OR OBTAINED OR MESSAGES RECEIVED OR TRANSACTIONS ENTERED INTO THROUGH OR FROM THE Australian-Shepherd-Lovers.com SITE; (iii) UNAUTHORIZED ACCESS TO OR ALTERATION OF YOUR TRANSMISSIONS OR DATA; (iv) STATEMENTS OR CONDUCT OF ANY THIRD PARTY ON THE Australian-Shepherd-Lovers.com SITE; OR (v) ANY OTHER MATTER RELATING TO THE Australian-Shepherd-Lovers.com SITE. YOU EXPRESSLY ACKNOWLEDGE THAT Australian-Shepherd-Lovers.com HAS ENTERED INTO THIS AGREEMENT, AND HAS AND WILL MAKE THE Australian-Shepherd-Lovers.com SITE AND CONTENT AVAILABLE TO YOU IN RELIANCE UPON THE LIMITATIONS AND EXCLUSIONS OF LIABILITY AND THE DISCLAIMERS SET FORTH IN THESE TERMS AND CONDITIONS, AND THAT THE SAME FORM AN ESSENTIAL BASIS OF THE BARGAIN BETWEEN YOU AND Australian-Shepherd-Lovers.com. YOU EXPRESSLY AGREE THAT THE LIMITATIONS AND EXCLUSIONS OF LIABILITY AND THE DISCLAIMERS SET FORTH IN THESE TERMS AND CONDITIONS WILL SURVIVE, AND CONTINUE TO APPLY IN THE CASE OF, FUNDAMENTAL BREACH OR BREACHES, THE FAILURE OF ESSENTIAL PURPOSE OF CONTRACT, THE FAILURE OF ANY EXCLUSIVE REMEDY OR TERMINATION OF THIS AGREEMENT. Australian-Shepherd-Lovers.com specifically does not make any warranties or representations as to the accuracy or completeness of any such Materials. Australian-Shepherd-Lovers.com periodically adds, changes, improves or updates the Materials on this Site without notice. Under no circumstances shall Australian-Shepherd-Lovers.com be liable for any loss, damage, liability or expense incurred or suffered that is claimed to have resulted from the use of this Site, including, without limitation, any fault, error, omission, interruption or delay with respect thereto. The use of this Site is at the User’s sole risk. Under no circumstances, including but not limited to negligence, shall Australian-Shepherd-Lovers.com be liable for any direct, indirect, incidental, special or consequential damages, even if Australian-Shepherd-Lovers.com has been advised of the possibility of such damages. The User specifically acknowledges and agrees that Australian-Shepherd-Lovers.com is not liable for any conduct of any User. This site may contain advice, opinions and statements of various authors. Australian-Shepherd-Lovers.com does not represent or endorse the accuracy or reliability of any advice, opinion, statement or other information provided by any information provider, any User of this Site or any other person or entity. Reliance upon any such advice, opinion, statement, or other information shall also be at the User’s own risk. Australian-Shepherd-Lovers.com shall not be liable to any User or anyone else for any inaccuracy, error, omission, interruption, deletion, defect, alteration of or use of any content herein, or for its timeliness or completeness, nor shall they be liable for any failure of performance, computer virus or communication line failure, regardless of cause, or for any damages resulting therefrom. As a condition of use of this Site, the User agrees to indemnify Australian-Shepherd-Lovers.com from and against any and all actions, claims, losses, damages, liabilities and expenses (including reasonable attorneys’ fees) arising out of the User’s use of this Site, including, without limitation, any claims alleging facts that if true would constitute a breach by the User of these Terms and Conditions. If the User is dissatisfied with any Material on this Site or with any of its Terms and Conditions of Use, the User’s sole and exclusive remedy is to discontinue using the Site. This Site may contain links and references to third-party web sites. The linked sites are not under the control of Australian-Shepherd-Lovers.com, and Australian-Shepherd-Lovers.com is not responsible for the content of any linked site or any link contained in a linked site. 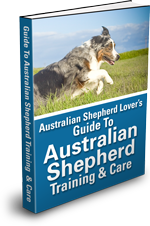 Australian-Shepherd-Lovers.com provides these links only as a convenience, and the inclusion of a link or reference does not imply the endorsement of the linked site by Australian-Shepherd-Lovers.com. The Australian-Shepherd-Lovers.com Site may make available certain information provided by third parties related to various professional fields such as, without limitation, medicine and other health and fitness related matters, law and financial planning (the "Professional Information"). The Professional Information is provided for educational and entertainment purposes only and should not be interpreted as a recommendation for a specific treatment plan, product or course of action. Use of the Australian-Shepherd-Lovers.com Site does not replace consultations with a qualified medical, legal, financial or other relevant professional. In addition, while the Professional Information is frequently updated, this information changes rapidly and therefore, some of the Professional Information may be out of date. You agree that all risk associated with the use of, or reliance on, any of the Professional Information rests with you. You further agree that Australian-Shepherd-Lovers.com, including its suppliers, shall not be responsible or liable, directly or indirectly, in any way for any loss or damage of any kind incurred as a result of, or in connection with your use of, or reliance on, any such Professional Information. The Professional Information may contain health-related and medical-related information (including any facts, views, opinions, recommendations, descriptions of, or references to, products, services and medications). Such health-related and medical-related information made available by Australian-Shepherd-Lovers.com is: (a) for informational purposes only; (b) not to be used or construed as a substitute for professional medical advice, diagnosis, or treatment; (c) not intended as a recommendation or endorsement of any specific tests, products, procedures, opinions or any other information. Reliance on any health-related or medical-related Professional Information on, or accessible through, the Australian-Shepherd-Lovers.com Site is solely at your own risk. ALWAYS SEEK THE ADVICE OF YOUR VETERINARIAN OR OTHER QUALIFIED HEALTH PROVIDER WITH ANY QUESTIONS YOU MAY HAVE REGARDING A MEDICAL CONDITION. NEVER DISREGARD PROFESSIONAL MEDICAL ADVICE OR DELAY IN SEEKING IT BECAUSE OF SOMETHING YOU HAVE READ ON THE Australian-Shepherd-Lovers.com SITE. User Submission License. Where Australian-Shepherd-Lovers.com has specifically invited or requested submissions, Australian-Shepherd-Lovers.com encourages members of the public to submit user published content or user content (e.g. postings to forums, photographs, videos, user profiles or other services) to Australian-Shepherd-Lovers.com ("User Submissions"). User Submissions remain the intellectual property of the individual user. By posting content on our website or by submitting content directly to Australian-Shepherd-Lovers.com, you expressly grant Australian-Shepherd-Lovers.com a non-exclusive, perpetual, irrevocable, royalty-free, fully paid-up worldwide, fully sub-licensable right to use, reproduce, modify, adapt, publish, translate, create derivative works from, distribute, transmit, perform and display such content and your name, voice, and/or likeness as contained in your User Submission, in whole or in part, and in any form throughout the world in any media or technology, whether now known or hereafter discovered, including all promotion, advertising, marketing, merchandising, publicity and any other ancillary uses thereof, and including the unfettered right to sublicense such rights, in perpetuity. Any such User Submissions are deemed non-confidential and Australian-Shepherd-Lovers.com shall be under no obligation to maintain the confidentiality of any information, in whatever form, contained in any User Submission. Australian-Shepherd-Lovers.com will be entitled to use each User Submission for any commercial or other purpose whatsoever without compensation or other accounting to you or any other person sending the User Submission. You will continue to be responsible for the substance of the Submission including, without limitation, any indemnification obligations related to such User Submission. By submitting any User Submission, you represent and warrant that you have the full right and authority to submit such User Submission, and that none of such User Submission is subject to any copyright or other proprietary right of a third party or is in any respect illegal or in violation of any law. Australian-Shepherd-Lovers.com reserves the right to review, edit, or remove any User Submission that Australian-Shepherd-Lovers.com deems, in its sole discretion, to be inappropriate, illegal or offensive for the Website, for any reason whatsoever. 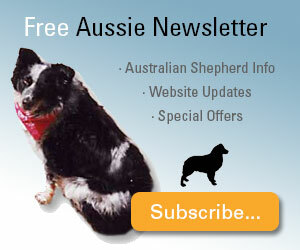 By submitting an email address to Australian-Shepherd-Lovers.com whether directly from our web site, our network web sites, or a third-party submission service, you are agreeing to accept email from Australian-Shepherd-Lovers.com. We reserve the right to edit submissions made to Australian-Shepherd-Lovers.com to ensure standards of confidentiality and fairness are upheld. Australian-Shepherd-Lovers.com is controlled, operated and administered within Canada. Australian-Shepherd-Lovers.com makes no representation or warranty that the Australian-Shepherd-Lovers.com Site is appropriate or available for use at any locations outside Canada. If you access the Australian-Shepherd-Lovers.com Site from outside Canada, you are responsible for compliance with all applicable laws. You may not export any of the Content accessible through the Australian-Shepherd-Lovers.com Site in violation of applicable export laws and regulations. These Terms and Conditions shall be interpreted, construed and governed by the laws in force in the Province of Alberta, and the federal laws of Canada applicable therein, without reference to its conflict of laws principles. Each party hereby agrees to submit to the jurisdiction of the courts of the Province of Alberta, in the city of Calgary and the Federal Courts situate therein, and to waive any objections based upon venue. The United Nations Convention on Contracts for the International Sale of Goods does not apply to these Terms and Conditions. Australian-Shepherd-Lovers.com reserves its exclusive right in its sole discretion to alter, limit or discontinue the Site or any Materials in any respect. Australian-Shepherd-Lovers.com shall have no obligation to take the needs of any User into consideration in connection therewith. Australian-Shepherd-Lovers.com reserves the right to deny in its sole discretion any user access to this Site or any portion thereof without notice. No waiver by Australian-Shepherd-Lovers.com of any provision of these Terms and Conditions shall be binding except as set forth in writing and signed by its duly authorized representative. These Terms and Conditions constitute the entire agreement between Australian-Shepherd-Lovers.com and you pertaining to your use of the Australian-Shepherd-Lovers.com Site and, except as specifically set forth herein, supersede any prior agreements between you and Australian-Shepherd-Lovers.com relating to the Australian-Shepherd-Lovers.com Site. Australian-Shepherd-Lovers.com may assign these Terms and Conditions, in whole or in part, at any time. Australian-Shepherd-Lovers.com's failure to insist upon or enforce strict performance of any right or provision of the Terms and Conditions shall not constitute or be construed as a waiver of any right or provision. If any of the provisions (or parts thereof) contained in the Terms and Conditions are determined to be void, invalid or otherwise unenforceable by a court of competent jurisdiction, such determination shall not affect the remaining provisions (or parts thereof) contained herein. Your use of this web site constitutes agreement with these terms and conditions of use. All content found on Australian-Shepherd-Lovers.com is the sole property of Australian-Shepherd-Lovers.com unless otherwise noted. Duplication, downloading or other use of any content is expressly prohibited without prior written consent.